Over 2 Million Square Feet Coated and 10 Years Expertise. We are an authorized dealer and the exclusive Louisiana contractor for Astec Roof Coatings. Astec Roof Coatings reflect heat and insulate your building, leading to energy savings. An Astec system can be fluid-applied right on top of most traditional roofing types and will act as a seamless wind and waterproofing barrier. Want to know more about us? GreenStar Roof Coatings, a New Orleans-based company, specializes in energy-efficient solutions for commercial rooftops. Contact us for more information today! Mark Lewis of Digital Gumbo discusses new roofing technologies with Dave Lamouranne. Tulane finance professor Peter Ricchiuti and WWNO presents, “Dat On a Cool Tin Roof” with GreenStar Coatings. 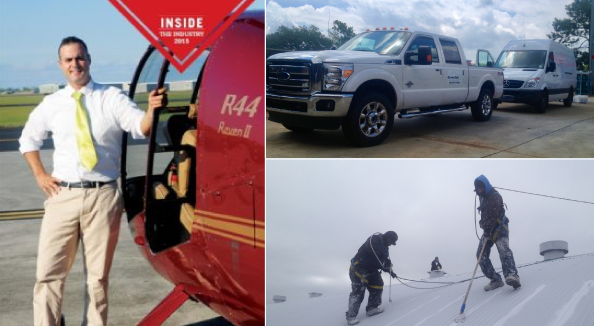 Inside the Industry: Commercial Roofing with GreenStar Coatings in New Orleans. High Profile, Winds, and Reflectivity: Green Coatings on New Orleans Airport Roof. Biz New Orleans, “Put a Coat On – It’s Hot Out There” with GreenStar Coatings.